Click on a game title to download it. Click on a particular file type to get more information about what you need to open it. This game is inspired by a puzzle devised by Albert Einstein, who supposedly claimed that only 2% of people in the world can solve it. Your goal in the game is to open all cards in 6x6 square. To do this, you have to deduce the correct layout from a few hints that describe the relationships between card positions. This game can help you to enhance your intellectual skills, which can also be helpful in studying the Bible. 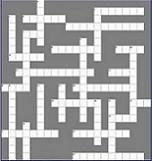 EclipseCrossword is a free application that makes creating crossword puzzles ridiculously easy. Just give it a list of words and clues, and it gives you a crossword puzzle that you can save and share, print out for photocopying and distribution, and even save as a Web page for posting on the Internet. Sam Loyd was the greatest America's puzzle creator. His legendary book is now in public domain.